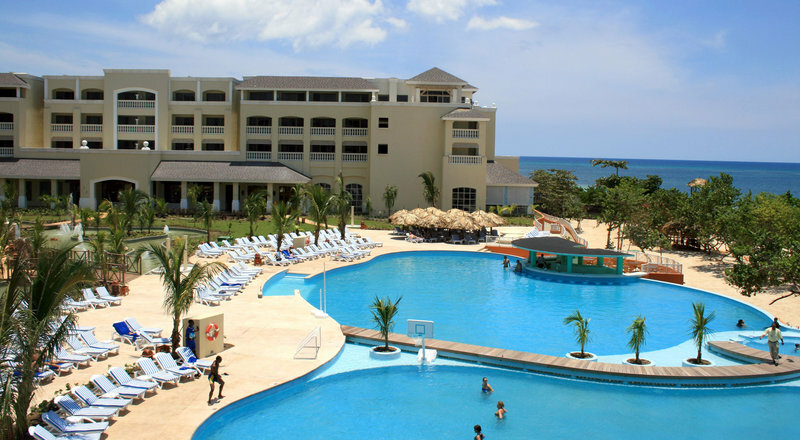 Part of the IBEROSTAR Premium Collection, the IBEROSTAR Rose Hall Beach is a 5-star all-inclusive luxury resort in Montego Bay. This resort is the recipient of the 2013 Green Globe Award. A total of 366 rooms and suites are available at this resort. Options include Standard Rooms, Ocean View Standard Rooms, Standard Ocean Front Rooms, and Ocean Front Junior Suites. Rooms include a stocked mini-bar, safe, and terrace or balcony. Room service is available during certain hours. With 3 specialty restaurants, 1 buffet, 6 bars/lounges, and a swim-up bar, there is something for everyone. Steakhouse, French, African, Japanese, and other international dishes are offered daily. Families can enjoy their time in the large infinity pool, watching theater performances, listening and dancing to live music, taking dance lessons, watching animated shows, and much more. Specifically for children there is a kid’s pool, kid’s club, and playground. Adults can also enjoy a game of billiards or a trip to the disco and casino. Stay fit with a trip to the health club, complete with various machinery and aerobics routines. There is a nearby 18-hole golf course for use and well as ping pong tables. Guests can also participate in scuba diving school or parasailing.